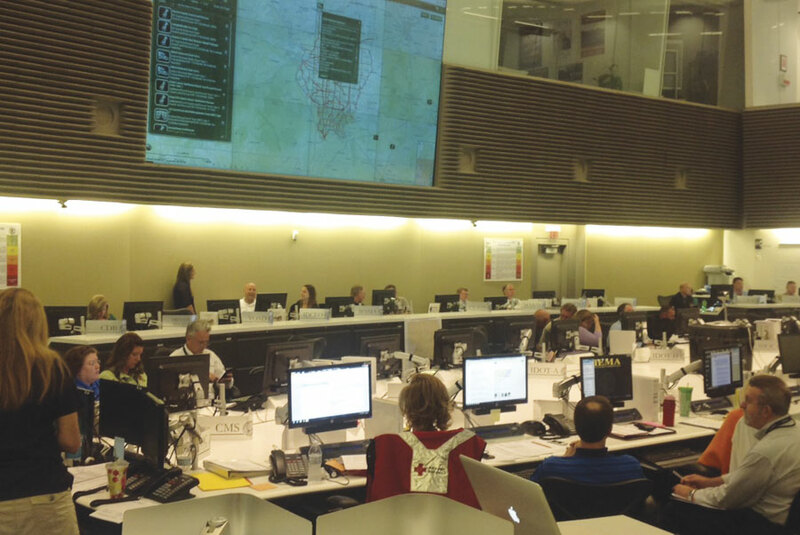 A dashboard at the Illinois Emergency Management Agency shows the status of Mission Ready Packages and Essential Elements of Information for preparedness and response. For years, GIS has been an important tool for improving situational awareness, especially in emergency preparedness and response. During a crisis, having a clear, real-time understanding of the situation as it unfolds is critical for making decisions that help save lives. The challenge for decision makers has always been to acquire and analyze meaningful information so they can make timely and informed decisions. GIS—with its capacity to mash up and visualize multiple datasets in a single platform—makes it easier to identify the data you need to make those decisions. The advantages of GIS were demonstrated time and again during projects carried out as part of the Department of Homeland Security Science and Technology Directorate's Virtual USA (vUSA) initiative. Launched in 2009, it was designed to establish and demonstrate best practices for situational awareness. An important part of the success of that program—which, to date, has engaged more than 30 states, hundreds of cities and counties, and various federal agencies—has been the use of GIS to create situational awareness platforms, or "viewers," and applications that provide emergency management personnel with real-time information visualization so they can make better use of the data at hand. To a certain extent, the vUSA program accounts for the increasingly widespread use of GIS across the homeland security enterprise over the last five to seven years. But the role and importance of GIS have dramatically changed. Within the last year, GIS has become a foundational, mission-critical technology for homeland security and emergency preparedness and response missions. The creation of the web map format, coupled with the deployment of web GIS, was a game changer. Now, homeland security and emergency management professionals have unprecedented capabilities to obtain, share, make sense of, and use information in increasingly more effective ways. This became stunningly apparent during last summer's Central US Earthquake Consortium CAPSTONE-14 exercise, which centered on the very real possibility of a catastrophic earthquake impacting the New Madrid Seismic Zone in the southern and midwestern United States. That exercise, supported by the Department of Homeland Security's Science and Technology Directorate (DHS S&T) and the National Information Sharing Consortium (NISC), was designed to create and demonstrate real-time information sharing, near real-time situational awareness, and mutual aid coordination across eight primary states (and 12 associated states); more than 420 counties; and 45 companies, nonprofit organizations, and federal agencies. 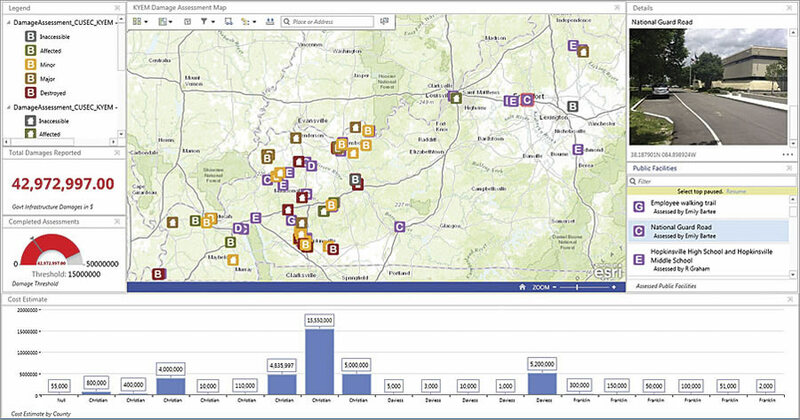 Operations Dashboard for ArcGIS, used in conjunction with Collector for ArcGIS, is a vital tool for monitoring damage assessment in an emergency. The challenge for participants was to figure out how to coordinate activities by sharing imperative information housed and owned by different agencies—each with different, and sometimes proprietary, systems of record. With technical support from Esri and its Silver Tier partner G&H International Services, planners had to develop data interoperability networks that functioned seamlessly across organizations. They ended up integrating data from scores of systems, sharing more than 2,500 datasets, producing over13,000 dynamic information alerts, and handling more than a dozen mutual aid requests. The technical team—composed of GIS specialists from various states, as well as staff from G&H and Esri—also created an assortment of applications to improve cooperation and collaboration, including the Mission Ready Package tool, which enables users to find mutual aid resources in real time. They deployed Collector for ArcGIS in more than 20 counties as well so they could assemble real-time situation reports. After CAPSTONE-14, the National Emergency Management Association (NEMA) officially adopted the automated Mutual Aid Support System (MASS) that was tested during the exercise, which uses an organization's existing resource management software to find aid resources. NEMA is now creating an updated version of MASS, or Emergency Management Assistance Compact System 2.0, as a national capability to improve mutual aid across all 50 states. Moreover, NISC has adopted a standardized approach for identifying Essential Elements of Information for preparedness and response. The consortium is now working with DHS S&T and others to proliferate the method, which will improve information sharing abilities across the country. And here's the crucial aspect of all this: It was GIS—specifically web GIS and the web map format—that made everything possible. ArcGIS Online served as the interoperability platform, or hub, that allowed participants to integrate information housed in so many different systems of record. The web map was the building block of that effort because it made it possible to turn each dataset into a web service and then share that with all participants. Thus, once enabled, the tools provided on Esri's web GIS platform let participants use data in numerous ways, resulting in a dramatic improvement in coordination, force multiplication, and decision making. CAPSTONE-14 was an enormous advancement for the homeland security community, but it wasn't an isolated one. Many other exercises and projects have further demonstrated the critical importance of GIS. In June 2015, NISC concluded its First Responder Implementation Project that was designed to test the lessons learned from CAPSTONE-14 and apply them at a local level. Unlike CAPSTONE-14, which was a state-to-state emergency management exercise, the NISC project began by identifying information-sharing challenges at a local level—where all incidents begin. This enabled NISC to identify, map out, and address issues that arise first within a local organization, then across multiple disciplines within a locality (such as fire, emergency management, and law enforcement), and, finally, across various local agencies (including cities and counties). Having to work with numerous organizations that have their own policies and procedures increased the complexity of the challenge. Yet, once again, GIS became the cornerstone of the solution. As James City County emergency management coordinator Kate Hale said during the after-action briefing, "ArcGIS Online is our interoperability platform." The opening line of US president Barack Obama's "National Strategy for Information Sharing and Safeguarding" says, "Our national security depends on our ability to share the right information, with the right people, at the right time." As we have seen in nearly every major incident—from the terrorist attacks on September 11, 2001, to natural disasters such as hurricanes Katrina and Sandy—lack of authoritative, actionable, and timely information leads to unnecessary suffering, excessive property damage, and the tragic loss of lives. The importance of information sharing cannot be overstated. The proven role of GIS as a conduit of information sharing makes it a mission-critical technology for preparing for, responding to, recovering from, and mitigating any incident—whether it is in an emergency situation or has to do with business planning, monitoring public health, analyzing crime, or any number of other, distinct situations. GIS has always been good to have, but now it is a must-have. While there is still much hard work to do to realize GIS as a truly ubiquitous interoperability platform, the pathway to achieve it has never been clearer. Bob Greenberg is the founder and CEO of G&H International Services, which helps organizations build lasting operational capacity and become more self-sufficient. He can be reached at rgreenberg@ghinternational.com.